Where is Vietnamese society heading if it fails to cultivate and nurture its centuries-old traditional folk art and cultural practices? 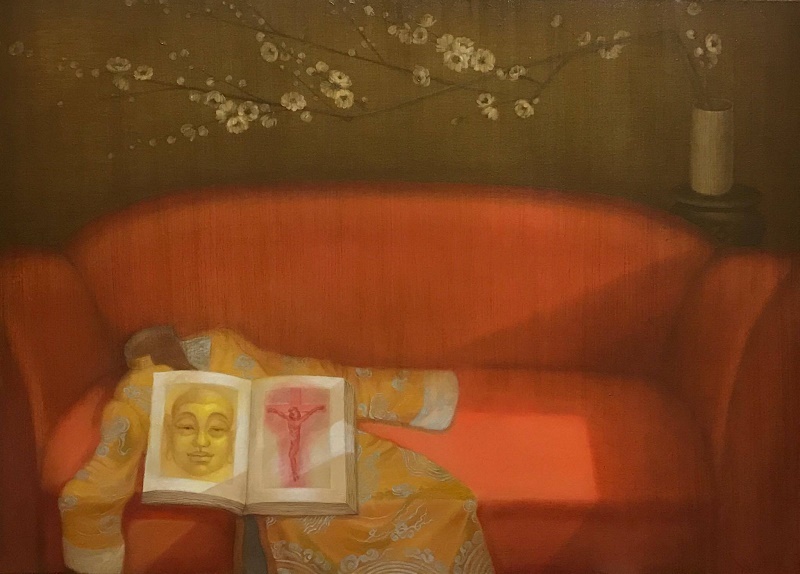 At first glance, the paintings of Bui Thanh Tam’s Abandoned by Heaven collection project an air of innocence and a pollyanish sense of contentment. The doe-eyed figures in the paintings look to be in the midst of living happy and prosperous lives, but there is something amiss lying just underneath the surface of the paintings. The most easily distinguishable signal is given in the form of the twisted branches of the peach blossom trees featured in many of the paintings. They are in full bloom, which brings associations of spring and renewal, but the unnatural positions of the branches suggest a conscious contortion that has distorted what was once beautiful and pure. The central question Tam is asking with his latest series is: Where is Vietnamese society heading if it fails to cultivate and nurture its centuries old traditional folk art and cultural practices? The material progress the country has made over the past two decades is undoubtedly a profoundly positive development for the great majority of its citizens, but it also comes with certain costs that can be measured and quantified in terms of environmental degradation and other negative side effects. In his role as a contemporary artist, Tam feels a responsibility to do a more abstract calculation of the cultural costs that have been associated with Vietnam’s recent period of rapid urbanization and economic development. While there is an earnest moral lesson at the heart of his work, Tam leavens the potential didacticism through the use of parody and humor. 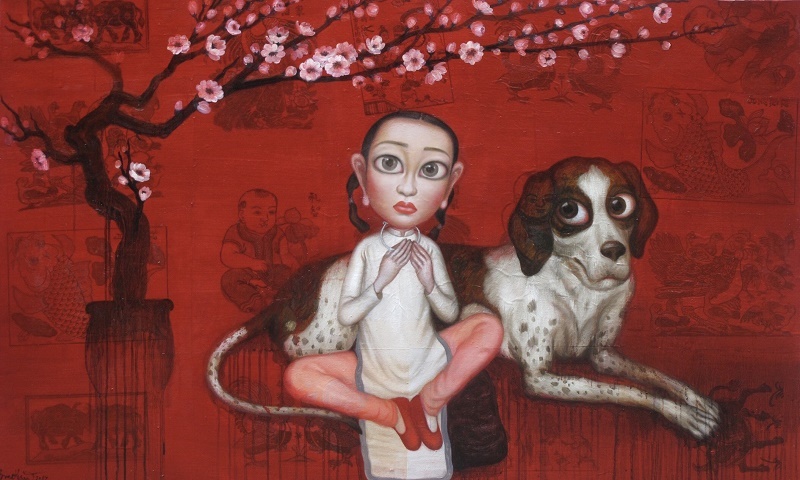 His often whimsical paintings focus on the ridiculous contradictions between his subjects’ contemporary lives and his view of a more traditional Vietnamese existence. Tam has spoken of the influence that the Cynical Realism of Chinese painters has had on his work. Arising in China in the 1990s, the work of the Cynical Realists used humor and irony in confronting their society’s socio-political issues through their art. Featuring characters that often shared the exaggerated grinning face of the artists themselves, the art of the Cynical Realists focused on the transition from the old to the modern that China was experiencing and the confusion arising therefrom. 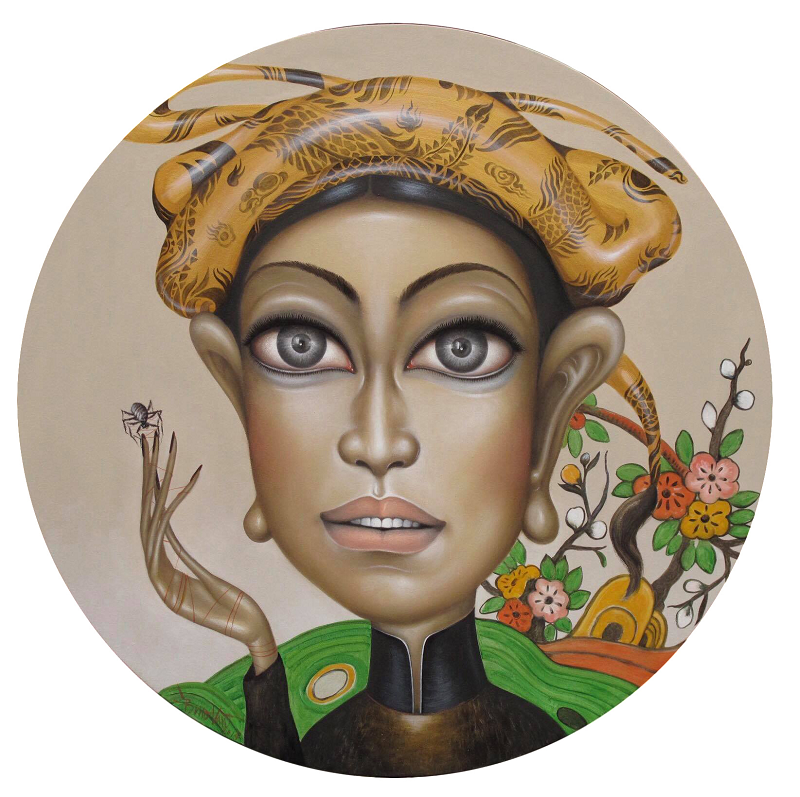 In a similar way, Tam’s paintings can be seen as cynical commentaries on the state of contemporary society in Vietnam. 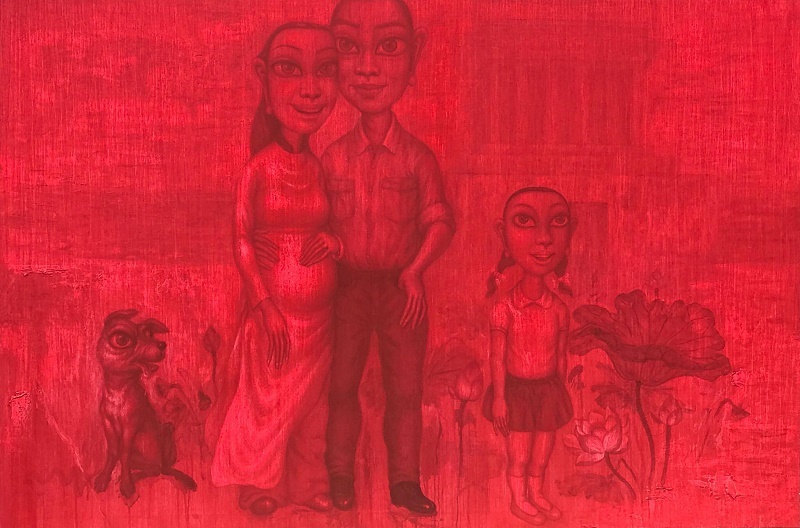 Tam chooses to use Dong Ho folk paintings in the background of many of his works as an over-arching symbolic representation of traditional Vietnamese culture. The traditional themes of Dong Ho paintings include good luck signs, historical figures, folk allegories and popular stories. The compositions tend to reflect the lifestyles and concerns of a rural people living in close commune with nature. Most commonly associated with Tet, Dong Ho paintings have long been used in Vietnam by craftspeople to express their concerns about social, political and cultural issues. As a metaphor for cultural loss, Tam’s choice of Dong Ho paintings is an apt one. Once produced by hundreds of craftspeople in a number of villages of Northern Vietnam, the practice has all but died out. Once a proud piece of Vietnam’s cultural heritage, Dong Ho paintings are now likely to be produced on printing presses and sold as kitsch to foreign visitors to the country. Bui Thanh Tam currently resides in Hanoi. He is a 2009 graduate of the Vietnam Fine Arts University. Abandoned by Heaven is Tam’s second solo exhibition at Craig Thomas Gallery (www.cthomasgallery.com).